The Gate Hotel with a couple of 'customers' outside for the photo? Date unknown picture is from my tiny postcard collection. The Gate Hotel has to be one of the most stunning buildings in Nuneaton today. Its had its fair share of tenants over the years currently its a children schoolwear shop and storerooms. When it was built there was no expense spared, Reginald plowed around £8000 into its creation. It had been said, "Nuneaton has been reproached as being architecturally, the personification of ugliness. Now with the additions of The Gate, Liberal Club and the Wesley Church, they were making good work on changing that". Photo from 2013 unchanged in over 100 years, only the top of the chimneys have gone more due to safety I would say. The wheels were set in motion in 1894 when the land on the corner of Abbey Street and Newdegate Street came up for grabs. 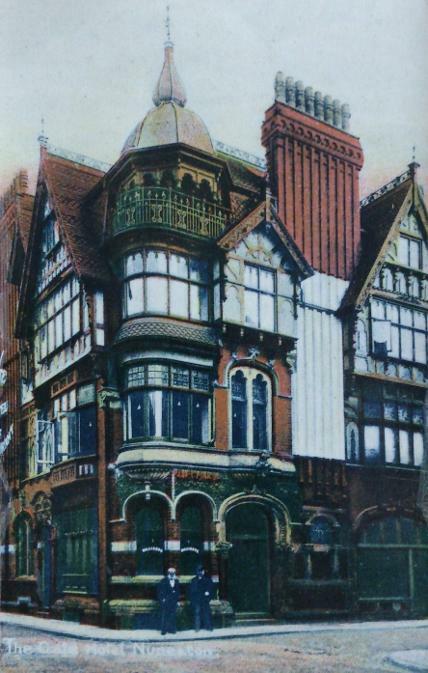 Reginald wanted this to be a place of stature and with its prime location he gave FJ Yates his trusted architect the all important job of producing a fine building. One Wednesday in June of 1894, a very large and influential crowd had gathered at the Newdegate Arms Assembly Room's for the sale of an important plot of land. Messrs Sands and Son were in charge of today's auction. The area on offer today was very centrally situated on the thoroughfare known as Abbey Gate and split into three plots. The financial market was stagnant at the present time and Mr Sands hoped with these prominent plots on offer they would buck the general trend tonight. 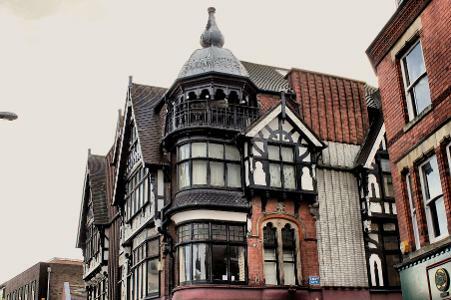 They got right down to business and plot one consisted of the freehold dwelling house and shop situate at the corner of the Market Place and Abbey Gate with a total of 126 square yards of land and currently occupied by Mr John Winfield. The bids started at £1000 which was taken immediately and rapidly rose to £1750, at which sum the lot passed to the present occupier. 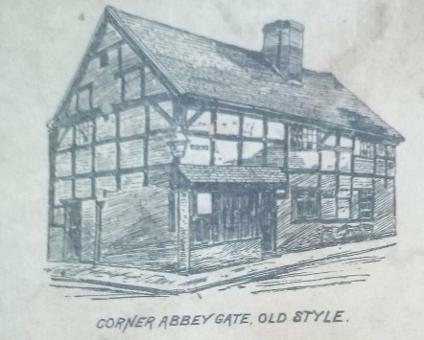 The second lot drew a lot of peoples attention, it consisted of the picturesque, half timbered freehold dwelling and shop on the corner of Abbey Gate and Newdegate Street and is owned by Mr Daniel Mills. It contained front shop, store room, iving room, and four bedrooms, with a small yard and outbuildings at the rear. It had a frontage of 40ft to Abbey Gate and 20ft to Newdegate Street and contains 94 sq yards of land. The bidding got started at £500 and as the first plot it rose rapidly reaching £900 quite quickly, the hammer went down amid cheers, the winning bid went to Mr Reginald Stanley, J.P. 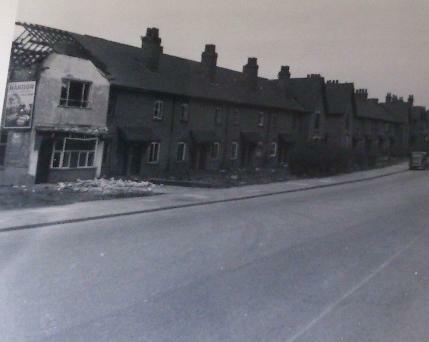 Plot three again consisted of a freehold dwelling and shop owned by Mrs Marlow. This time on Newedate Street with a frontage of 28ft 4in and contains 65sq yards. The top bid came in at £510 and again Reginald was the winner. He had the two properties he wanted, the position in the town was perfect for his grand idea and now it could become reality. They set about the work late in 1894. Its style was of the Tudor period and the finishing's would be English Oak. The open balcony under the turret roof always made me wonder what happened up there. It turns out that this was the billiard room, with the door open it must has been a nice site over the town from up there. The Gate was also fitted out with the most up to date boiler system and radiators. I have managed to get my hands on some of the letters that Reginald sent to the fitters of the system Messenger & Co Ltd. Thanks to the Museum of English Rural Life at Reading University for their help. It wasn't all plain sailing, the original boiler was changed at the last minute and the new "Cornish Boiler" leaked a bit. I've transcribed the letter (left) to Messenger & Co and not all was plain sailing with the building of the Gate Hotel. of the agreement entered into. P.S I hope you will take no time in completing." I'm not sure if you can see but the total cost of the boiler is written in faint ink at the top of the paper £316.2.0 and in today's money it would have cost around £5000 to fit. Not only a grand looking building outside but no expense spared inside as well. 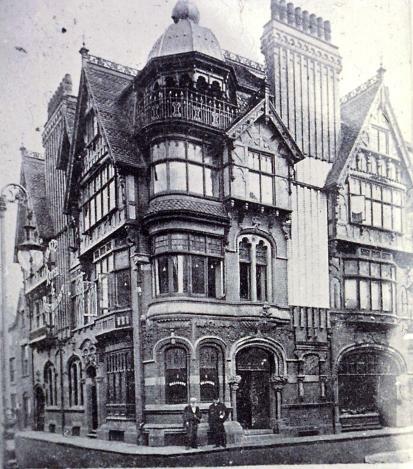 The running of the Gate Hotel and Coffee House was put into the hands of Mr Tom Dumbleton of Clifton, Bristol. He had experience of running a "Refreshment House" in the Clifton area of Bristol, which in its day was a upper class suburb of the city. 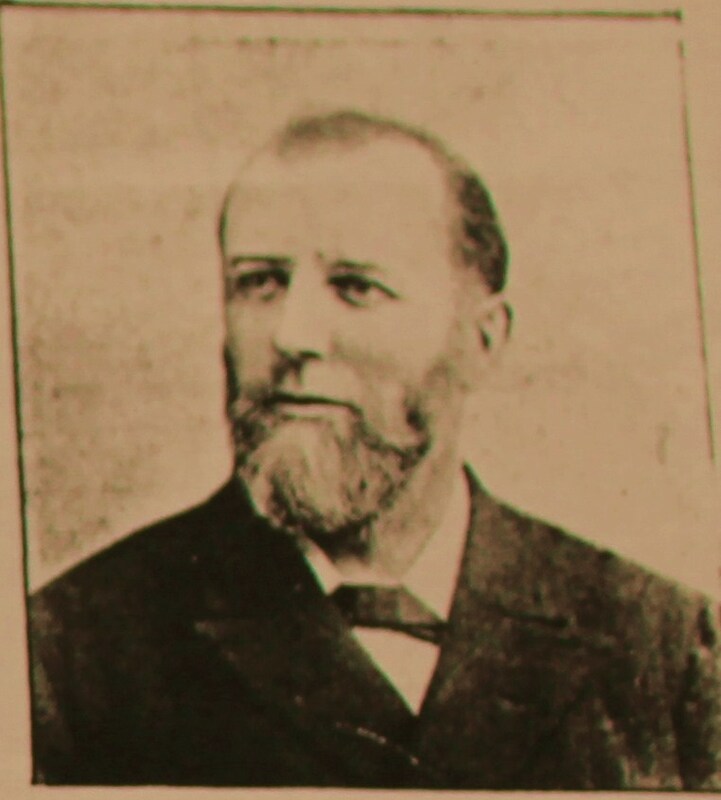 He then moved to Yeovil and was a Coffee Tavern Manager, before making the journey to Nuneaton and the newly opened "Gate" in 1896. 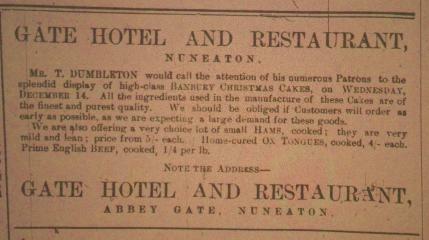 In the Nuneaton Chronicle of 1898, Tom is advertising the Hotel and the sale of "high class Banbury Christmas Cakes". I'm not sure if these were the famous Banbury Cakes, however they were made with the 'finest and purest quality'. By 1901 Tom had moved on, he was at another Temperance Hotel in Banbury (the cakes were a draw for him). He left his daughter Alice Maria aged just 22 in charge. Was this job too much for Alice? Was this the reason The Gate eventually didn't last past 1908? or was it the fact Nuneaton and the Temperance movement was never going to mix? 'The Gate' Hotel, Up for sale! The Boer War of South Africa (1899-1901) was raging thousands of miles away from the calm streets of Nuneaton. This war was having a major impact on Reginald Stanley and his growing empire. He had invested a lot of his money in the gold mining area of the country, it was a devastating blow one that Reginald wasn't going to recover from easily. Years past and his grip on Stanley Brothers was slipping away and he was being over powered by other board members. Then in 1908 after years of trying to steady the ship, an announcement was made in the Nuneaton Chronicle and Observer. J.A.Cartwright were instructed to sell by Auction at the Newdegate Arms Hotel, Nuneaton on Tuesday May 26th at 7pm precisely the following Valuable Freehold Properties and top of that list was.......... The Gate Hotel. 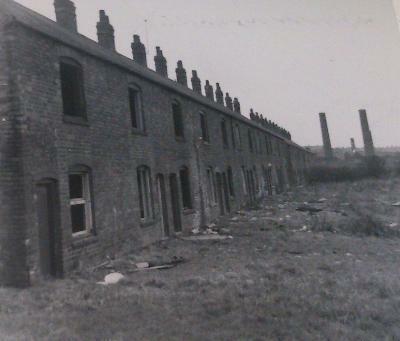 Not only was The Gate up for grabs but all of the houses along Lansdowne Terrace, 10 acres of ripe building land off Manor Court Road and 19 of the Sunnyside Cottages on Croft Road (below). Reginald was finding it tough going and his prized assets were reluctantly put up for sale. (1) Basement- Large Kitchen, Scullery, Caretakers Room, Store Room, Engine Room, Coal Place and Heating Apparatus Room. (2) Ground Floor - Large Restaurant Cook Shop, Dining Room, Yard, etc. (3) First Floor - reached by handsome mahogany staircase and spacious landing, Assembly Room, 42 feet 6 inches by 17 feet 6 inches, 2 Bedrooms, Lavatory and Offices. (4) Second Floor - Eight Bedrooms, Bathroom and W.C. There was a very large attendance at the Newdegate Arms Hotel. During the days running up to the auction, the talk on the street was all about the Gate Hotel and what the reserve might be? There was rumors certain gentlemen of the town were interested, but there was still an air of uncertainty on who. Mr J.A.Cartwright of Abbey Street, the auctioneer, first put forward the Gate Hotel and the crowds small talk suddenly abated. He thanked the "Nuneaton Cronicle" for providing the most fitting description of the hotel. describing on the night that it "stands in the front ranks of our prominent buildings in point of both external and internal elegance". It had cost Mr Stanley £8,000 to erect some 13 years previous and with its central position surely it was a worthy buy. Mr Cartwright now asked for bids.............. A voice from the crowd started the bidding at £2,000. It had emanated from Councillor A Raynor, a prominent figure of the town, followed by another bid from the crowd this time unknown, followed by one more bid taking it to £4,000. No more bids were placed and Mr Cartwright announced that the lot had not reached its reserve and was withdrawn. After all the build up to this day, it had ended with a no sale. The building must have passed into the hands of someone, but to date I have no information on who eventually got this amazing building. As we know today it's the Schoolwear shop and it has kept some of its external beauty, so passers by can admire and wonder what this building was ever used for.